Volcanic ashfall can be damaging and disruptive to critical infrastructure including electricity generation, transmission and distribution networks, drinking-water and wastewater treatment plants, roads, airports and communications networks. There is growing evidence that a range of preparedness and mitigation strategies can reduce ashfall impacts for critical infrastructure organisations. 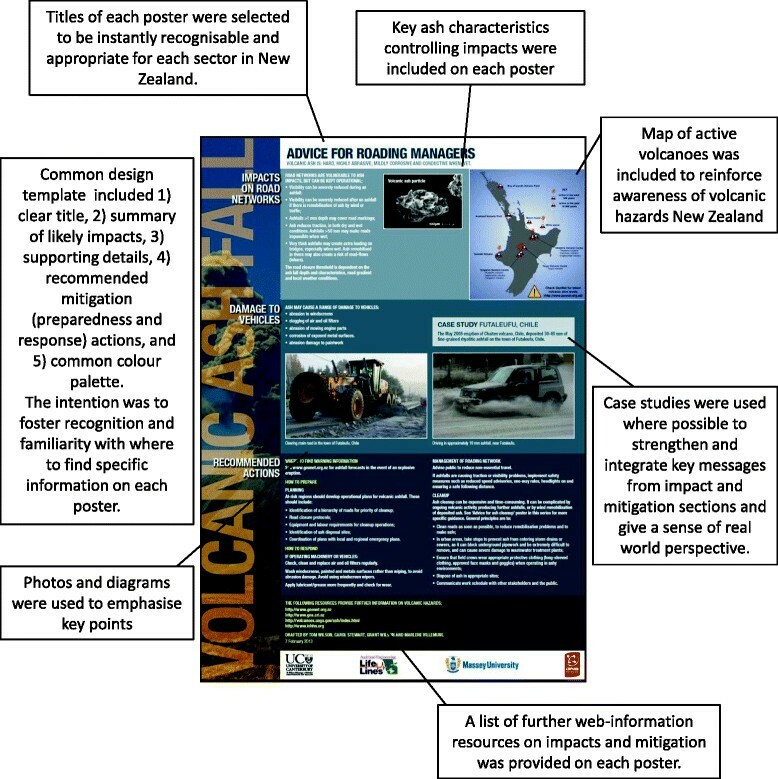 This paper describes a collaborative process used to create a suite of ten posters designed to improve the resilience of critical infrastructure organisations to volcanic ashfall hazards. Key features of this process were: 1) a partnership between critical infrastructure managers and other relevant government agencies with volcanic impact scientists, including extensive consultation and review phases; and 2) translation of volcanic impact research into practical management tools. 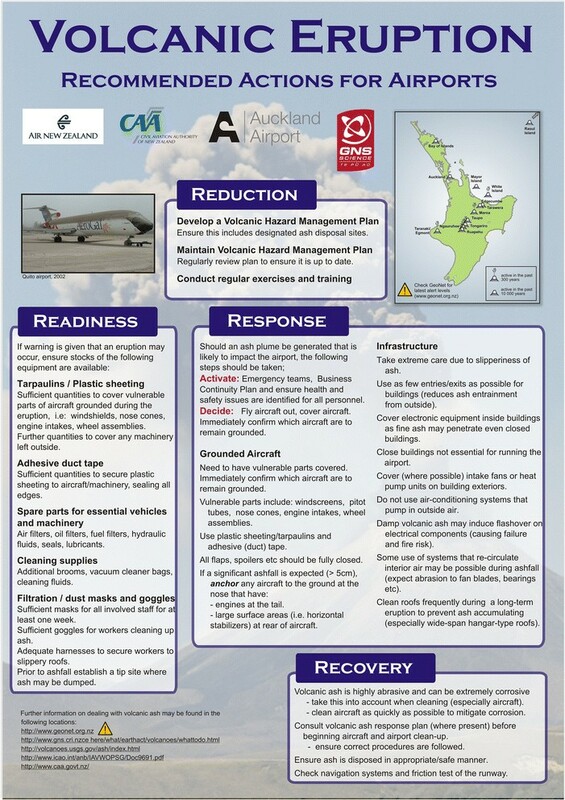 Whilst these posters have been developed specifically for use in New Zealand, we propose that this development process has more widely applicable value for strengthening volcanic risk resilience in other settings. Volcanic ashfall can cause a range of societal impacts. Ashfalls of just a few mm can be damaging and disruptive to critical infrastructure services (also known as ‘utilities’ in some countries), such as electricity generation, transmission and distribution networks, drinking-water and wastewater treatment plants, roads, airports and communication networks (Wilson et al. [2012b]). Disruption of service delivery can have cascading impacts on wider society. Ashfall can be very widely distributed, potentially affecting communities hundreds of kilometres from the erupting volcano. For example, the recent June 2011 eruption of Puyehue-Cordón Caulle volcanic complex, in southern Chile, deposited ashfall over approximately 75,000 km2 of Argentinian Patagonia (Buteler et al. ), with a substantial depth of 30–45 mm deposited on the major regional centre of San Carlos de Bariloche, population approximately 113,000. This led to extensive disruption of the city’s water supply, electricity distribution and generation networks, wastewater networks, ground and air transportation networks, and necessitated a major ash clean-up operation within the town (Wilson et al. [2012c]). Specific impacts of ashfall vary considerably, depending on factors such as plant or network design, ashfall characteristics (e.g. loading, grain-size, composition and levels of leachable elements), and environmental conditions before and after the ashfall. There is also growing evidence that a range of preparedness and mitigation strategies can reduce ashfall impacts (Wardman et al. [2012a], Sword-Daniels et al. ). Core components of disaster risk reduction includes (1) providing advice on likely impacts and best-practice mitigation strategies, and (2) encouraging communities or organisations to adopt preparedness measures which increase their ability to manage hazard consequences, and thus increasing their capacity to manage risk (Paton et al. ; UNISDR ). However, this is not as simple as it seems. Firstly, empowering society to utilise scientific and technological advances to reduce the impacts of disasters is a well-established challenge (Tobin and Montz ; Miletti ; Alexander ; ICSU , ; UNISDR ; Few and Barclay ; McBean ). Both the UNISDR Hyogo Framework for Action (HFA) and Integrated Research on Disaster Risk (IRDR) program to call for more integration of research with the needs of policy and decision makers (ICSU ). Few and Barclay () also stress the need to promote integrated, inter-disciplinary approaches, strengthen two-way links between research providers and end-users, and increase experimentation with research mechanisms (such as ‘embedded’ approaches) to support more effective research/end-user partnerships. Secondly, a review of recent risk perception and preparedness studies by Wachinger et al. () suggests that even if an individual perceives a high level of risk from a given hazard, this does not necessarily translate into this individual adopting appropriate risk mitigation behaviour for that given hazard. Ballantyne et al. () found that provision of hazard information by agencies can, paradoxically, decrease a community's perceived need to prepare as they will tend to transfer responsibility to these agencies. In the case of volcanic hazards, knowledge of proximity to volcanic hazards or susceptibility to their consequences does not assure mitigative actions will be taken, and preparedness levels often remain low in proximal regions even in developed countries (Paton et al. ). Even experiencing a volcanic eruption may not necessarily act as a catalyst for preparing for a future event (Johnston et al. ). These effects may be even more pronounced as eruptions are relatively infrequent and ‘exotic’ (Paton et al. ). For risk communication, simply providing information often fails to change risk perception or motivate volcanic hazard preparedness, implying that more engaged and appropriate strategies are required (Paton et al. ). This may be overcome by a more participatory process (Twigg ). When stakeholders (e.g. communities and organisations) actively participate as legitimate partners in the communication (and mitigation) exercise, they are empowered to make change which increases their resilience (Covello and Allen ; Paton et al. ). The communication exercise should also be transparent and led by a source which is authoritative, credible and trusted (Berlo ). 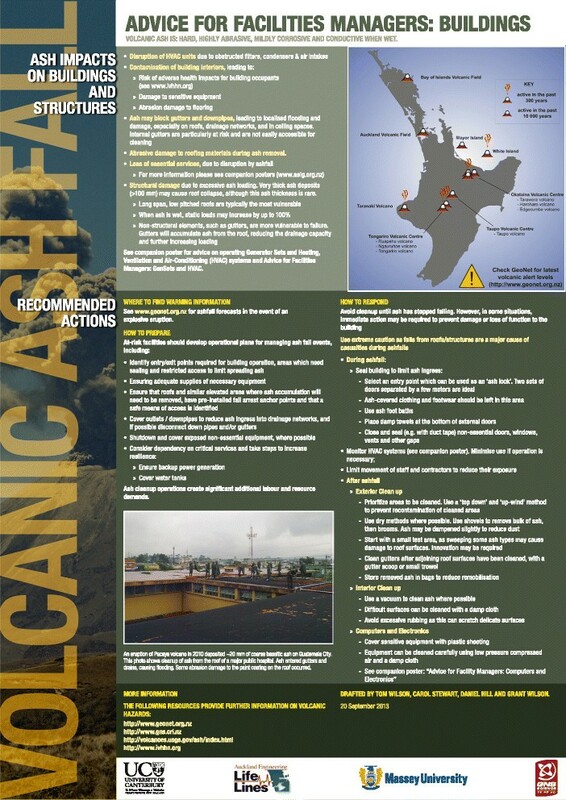 This paper describes an example of this approach, a collaborative process used to develop a suite of posters which summarise the potential impacts of volcanic ash and preparedness and mitigation strategies for different sectors of critical infrastructure. The effort included sustained exchange and development of best practices through collaboration among researchers, infrastructure managers and emergency managers from within an established practitioner-research volcanic impact advice structure in New Zealand. Over the past two decades there has been growing awareness in New Zealand (as for many other nations) that volcanic hazards can cause substantial and unique impacts on critical infrastructure (known as ‘lifelines’ in New Zealand). Consequently, a strong culture of natural hazard risk management within the critical infrastructure sector in New Zealand has developed, catalysed through the development of ‘regional engineering lifeline groups’ which are defined as “an informal, regionally-based process of lifeline utility representatives working with scientists, engineers and emergency managers to identify interdependencies and vulnerabilities to regional scale emergencies. This collaborative process provides a framework to enable integration of asset management, risk management and emergency management across utilities.” (NELC, ). Typically seismic, storm and flood hazards have been the focus, with well-established, evidence-based design codes and advice for preparedness and response strategies available (e.g. the Civil Defence and Emergency Management Act 2002, the Building Act 2004 and the Resource Management Act 1991 of the New Zealand Parliament). By comparison, volcanic hazards have received less attention. This disparity can be at least partially attributed to few, damaging volcanic events occurring during the past 60 years in New Zealand (OCDESC, ). However the 1995–96 eruption of Ruapehu volcano caused widespread and costly impacts to a range of critical infrastructure organisations in New Zealand, despite the relatively modest eruption magnitude (Johnston et al. ). The risk of lahars, blasts and surges closed all three ski fields on Ruapehu for many months while volcanic ashfall and lahars impacted critical infrastructure, agriculture and communities many tens to hundreds of kilometres from the volcano. Total losses were an estimated NZ$130 million (~NZ$188 million or US$161 million in 2014) (Johnston et al. ). Analysis of the performance of responding organisations (national, regional and local government agencies, utilities, emergency services and private businesses) by Paton et al. () found there was insufficient knowledge of volcanic hazard impact and appropriate mitigation strategies within these organisations. Nor was there sufficient access to information, which further exacerbated uncertainty regarding preparedness, response and mitigation decision-making. Many organisations looked to the government volcano monitoring agency (formerly the Institute of Geological and Nuclear Sciences, now GNS Science) and the universities for specialist impact and mitigation advice. However, there was limited volcanic impact information easily available, either within New Zealand or internationally (Johnston et al. ). The Ruapehu crisis was exacerbated by relatively rigid, top-down, siloed management structures at local and regional levels which did not cope well with the impacts occurring across a complex multi-jurisdictional setting (Paton et al. ). In particular, pre-existing networks between information providers and responders were found to be incomplete and inconsistent with respect to information needs. This detracted from effective communication between organisations hampered decision-making and coordination in an environment characterised by multi-organisational involvement and conflicting demands (Paton et al. ). Most organizations emerged from the Ruapehu disaster relatively unaffected, and many perceived that they had coped effectively with the demands of the disaster. However Paton et al. () argued that this may “stimulate overestimation of future response capability, underestimation of risk, and constrain thinking about future events, making it difficult to conceptualise alternative demands, problems or outcomes…and may ignore the negative outcomes or potential inadequacies of crisis management systems.” These authors argued that it was important to ensure that this experience did not result in complacency about future response effectiveness. 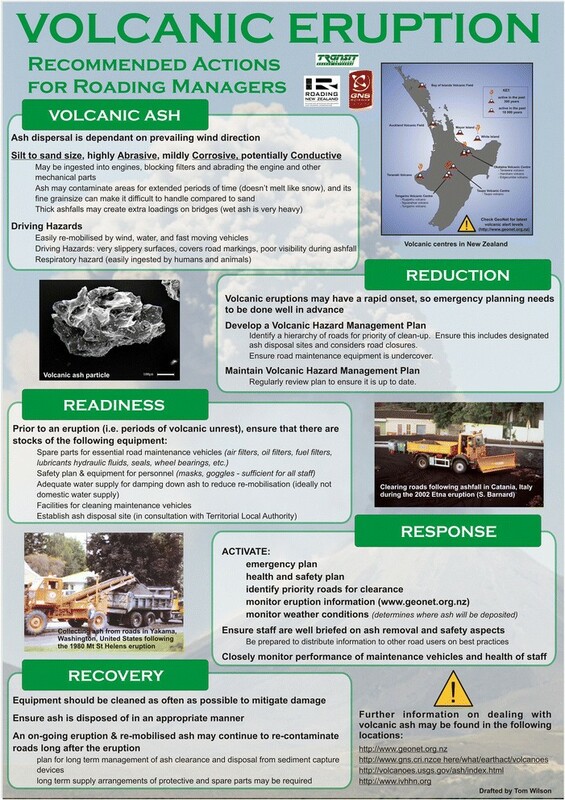 In the five to ten years after the Ruapehu eruptions, New Zealand’s approach to emergency management has evolved from a ‘civil defence’ approach to a ‘comprehensive emergency management’ approach with the passage of the Civil Defence and Emergency Management (CDEM) Act in 2002. This act recognised the unique challenges of managing disasters and emergencies, and stipulated a more coordinated, integrated approach which focused on developing partnerships and clarifying emergency management responsibilities of critical infrastructure companies. In this changing environment, the lessons from the 1995–96 Ruapehu eruption acted as a catalyst for 1) developing a volcanic impact evidence base to inform preparedness and mitigation decision-making (particularly for ashfall as the most frequently-produced and widely-distributed volcanic hazard); and 2) enhancing communication and coordination structures between volcano and risk scientists and stakeholders (Paton et al. ; Johnston et al. ; Leonard et al. ). As part of New Zealand’s increased investment in applied volcanology research over the past 15 years, a volcanic impact research group was formed between GNS Science and partner universities (University of Canterbury, Massey University, and University of Auckland). This group has pursued a sustained and systematic approach to assessing the impact of volcanic ash on critical infrastructure, for as wide a range of different eruption types and magnitudes. This group has undertaken reconnaissance trips to areas impacted by volcanic eruptions worldwide at varying intervals after the eruption, to capture both short and longer term impacts, timescales of recovery, successful mitigation strategies and overall management lessons (Table 1). A further goal is to develop quantitative risk tools, such as vulnerability and fragility functions that relate impacts to the amount and characteristics of ashfall received and to develop more quantitative relationships for use in risk modelling. The group has also studied cascading impacts of ashfall within a systems-thinking framework (Wilson et al. [2012b]; Sword-Daniels et al. ). More recently, empirical laboratory-based testing of critical infrastructure components has been conducted in our Volcanic Ash Testing Lab (VAT Lab) (Wilson et al. [2012a]; Wardman et al. [2012b]). The strategic focus of the full research group has been on understanding both ashfall impacts on individual system components and overall system functionality. The group has received ongoing funding support from the Natural Hazard Resource Platform (a multi-party research platform funded by the New Zealand Government dedicated to increasing New Zealand's resilience to Natural Hazards via high quality collaborative research), critical infrastructure organisations (primarily AELG organisations, described in the following section), and the New Zealand Earthquake Commission. In kind funding support from. To collate and advocate existing knowledge about the impacts of volcanic hazards (e.g. ash) on, and mitigation measures for, lifeline infrastructure. To facilitate and support research on the impacts of volcanic hazards on lifelines and people, and the development of appropriate mitigation measures. To provide input into the applicability for lifelines of any research being undertaken. To facilitate reconnaissance investigations, and/or advocate lifeline representation on reconnaissance investigations, to active volcanic areas where this would add to our knowledge about volcanic impacts on infrastructure. To provide a national focal point for volcanic impacts work on lifelines. Initially, the VISG was only focused on the Auckland region and was concerned primarily with impacts from the Auckland volcanic field, an active basaltic scoria cone field upon which Auckland City (pop. 1.5 million) is constructed (Lindsay et al. ). This focus has since broadened to support volcanic impacts research with any local, regional or national stakeholder in New Zealand. VISG provides a formalised networked structure between volcanic impact science providers (GNS and the universities) and critical infrastructure and emergency management organisations. Key activities of the VISG include undertaking focused research on volcanic impacts, contributing to volcano contingency planning and exercising when requested, and running an annual seminar on current research. Communication of appropriate volcanic impact science with end-users in a timely manner during an eruption crisis can be additionally challenging in the absence of adequate training and communication structures linked to expert knowledge. Pre-existing relationships between end-users and researchers, combined with readily available resources, can greatly reduce information searching and processing time, which aids decision-making timeliness and quality (Paton et al. ). The VISG aims to improve non-crisis and crisis communication between providers and recipients by developing relationships and resources which anticipate and provide for likely information needs. It fosters a group of information providers who can access, collate, interpret and disseminate information as needed within a known and regularly used framework. Likewise, the interaction with AELG and other lifeline group members contributes to developing a capacity within their own organisations to interpret, request and use specialist volcanic impact information. Specific activities have included multi-organisation workshops, targeted ‘sector specific’ workshops, one-on-one meetings and public lecture tours. Information is also provided to international volcanological initiatives, such as the USGS-GNS Volcanic Ash Impacts Website (http://volcanoes.usgs.gov/ash/), the International Volcanic Health Hazard Network (www.ivhhn.org) and the Cities on Volcanoes Commission of IAVCEI (http://cav.volcano.info/). Critical infrastructure organisations that have experienced adverse impacts during ashfall events commonly report low levels of prior awareness of ashfall hazards and impacts (Blong ; Paton et al. ; Ronan et al. ; Wilson et al. [2012b]). Whilst many organisations recognise the value of planning and preparedness for volcanic hazards, the necessary investment can be difficult to justify in the context of a variety of other hazards and business pressures. Feedback from AELG members suggested that lengthy reports summarising known impacts, mitigation options/recommendations and interdependency issues were useful, but only during infrequent detailed planning exercises. Authoritative but concise reference materials preferred as a means to inform planning and be readily available during a crisis, supplemented by additional information from science providers as needed. After some experimentation and consultation, posters were judged to be the optimal method for condensing key impact and mitigation information into a concise, palatable and visible form. The first series of posters was commissioned and completed during the period 2007–2010 for five infrastructure sectors: airports, road networks, drinking-water supplies, power-systems (networks), and wastewater collection and treatment systems (Figures 1, 2, 3, 4, 5). These sectors were selected by AELG and VISG members as most likely to be impacted. 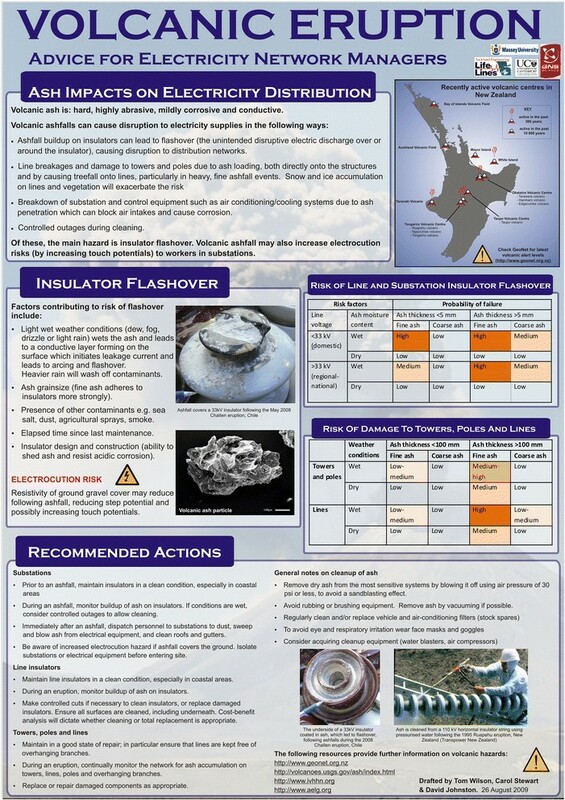 This edition of the posters were advertised widely in outreach activities, used during emergency management exercises and ultimately became a recognised information source in New Zealand (Bay of Plenty Engineering Lifelines Coordinator pers. comm. 2012). Recommended actions for airports to mitigate ashfall hazard. Recommended actions for Electricity Network Managers to mitigate ashfall hazard. Recommended actions for Road Managers to mitigate ashfall hazard. Recommended actions for Water Supply Managers to mitigate ashfall hazard. Recommended actions for Waste Water Managers to mitigate ashfall hazard. During subsequent review of VISG resources and risk communication strategy, it became apparent that the content of the first series of posters was becoming outdated; for example, global initiatives in the aviation sector (ICAO, ) needed to be incorporated into advice. Thus it was decided in 2012 that a) the current poster suite should be updated with the latest research and accounting for local and global developments, and b) that additional posters should be developed to address knowledge gaps. 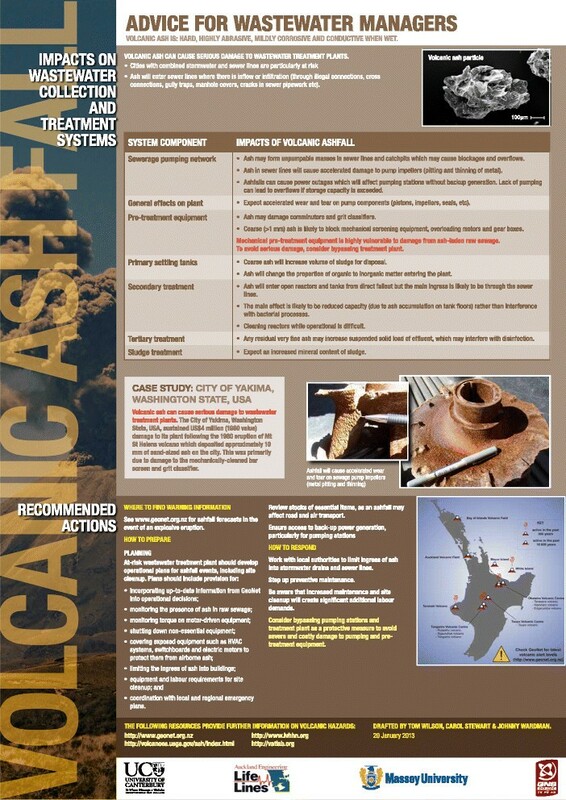 Subjects of particular interest were advice on ash cleanup operations for city authorities; impacts on building facilities; impacts on heating, ventilation and air-conditioning (HVAC) systems and emergency power generators; and impacts on computers and electronics. A further change was that the content of the original poster on power systems was split between two new posters: one on electricity generation facilities and the other on electricity transmission and distribution networks. This expansion made it possible to incorporate substantial new research in this area (Wardman et al. [2012a]). The new series of posters are shown in Figures 6, 7, 8, 9, 10, 11, 12, 13, 14, 15. We note that despite telecommunications being a key critical infrastructure sector, we did not consider there to be sufficient documentation of impacts or mitigation guidance to create a robust poster. Volcanic Ash: Advice for Water Supply Managers. Volcanic Ash: Advice for Wastewater Managers. Volcanic Ash: Advice for Power Plant Operators. 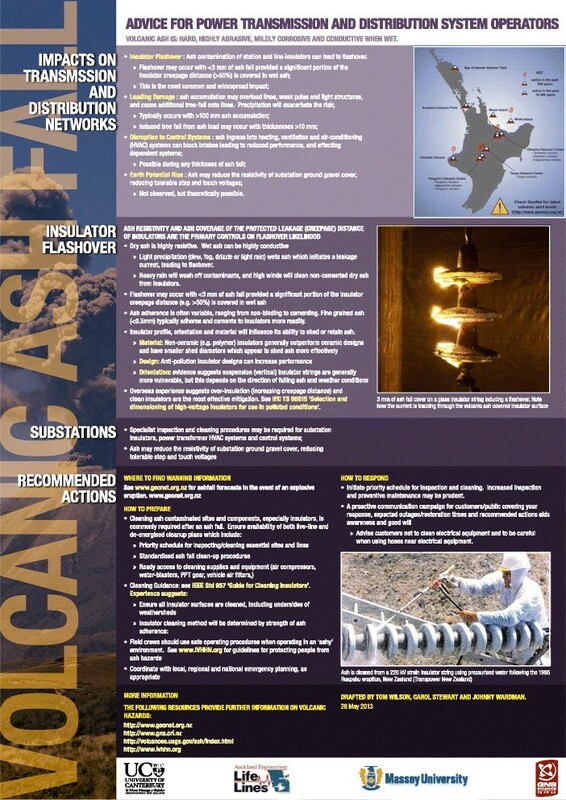 Volcanic Ash: Advice for Power Transmission and Distribution System Operators. Volcanic Ash: Advice for Roading Managers. 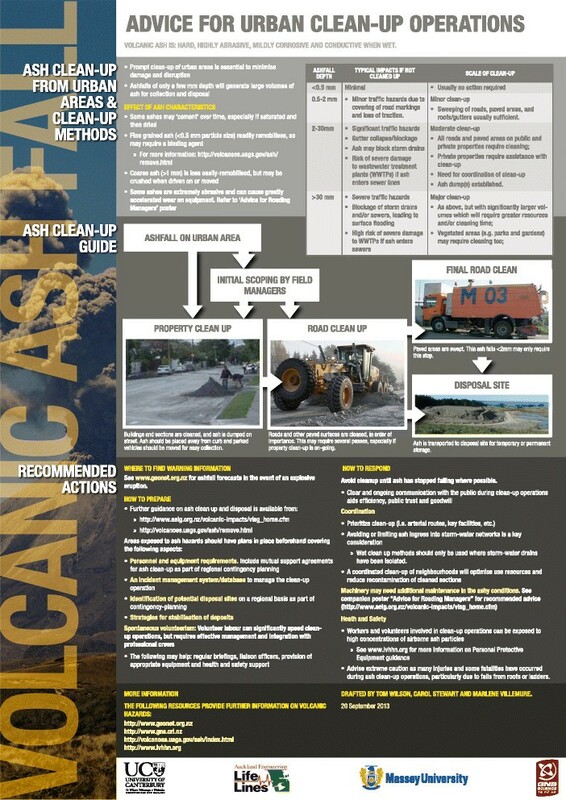 Volcanic Ash: Advice for Urban Clean-up Operations. Volcanic Ash: Advice for Airport Operators. 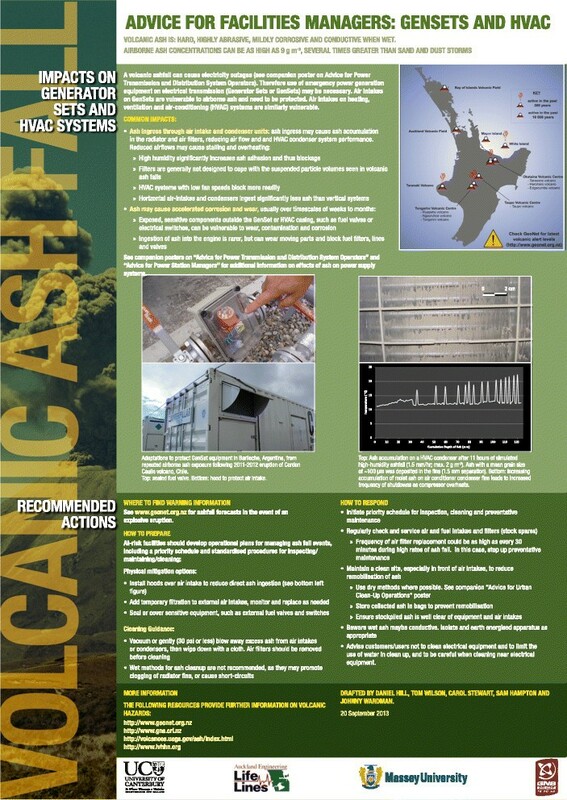 Volcanic Ash: Advice for Facilities Managers: GenSets and HVAC. Volcanic Ash: Advice for Facilities Managers: Computers And Electronics. Volcanic Ash: Advice for Facilities Managers: Buildings. Content was derived from the research team's observations of the consequences of volcanic eruptions around the world (summarised in Wilson et al. [2012b]). These insights were supplemented by findings from empirical laboratory experiments, such as the vulnerability of high-voltage transmission insulators to flashover from volcanic ash contamination (e.g. Wardman et al. [2012a]; [2012b]; Wilson et al. [2012b]). Poster content was written to be practical, with action-based knowledge. Expert elicitation from AELG members was used to ensure that content was technically correct, relevant and used accurate with terminology (Figure 16). Consultation broadened beyond AELG as required: power generating companies within Bay of Plenty Engineering Lifelines Group contributed to and reviewed ‘Advice for Power Plant Operators’, the Ministry of Health reviewed ‘Advice for Water Supply Managers’ and the Civil Aviation Authority reviewed ‘Advice for Airport Managers’. 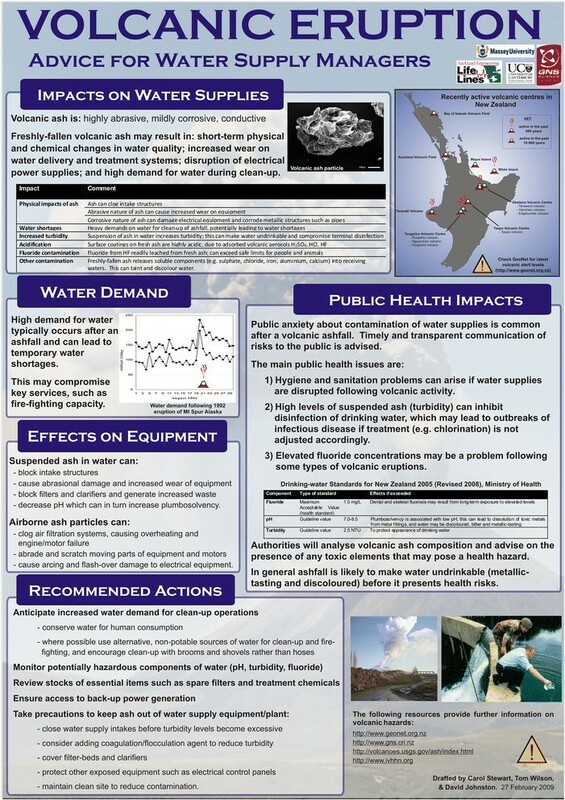 Active involvement with the Ministry of Health has also contributed to improved volcanic health impact coordination between volcanic impact scientists and public health professionals. This approach ensured access to the best possible knowledge, facilitated broad participation of relevant organisations, increased awareness of the posters as a resource, and raised the visibility of VISG. Diagram summarising extent of consultation process for volcanic impact and mitigation posters. Blue: critical infrastructure organisations who chose to actively participate in process; Green: critical infrastructure advisory groups; Red: poster design team; Purple: government agency; Yellow: science groups (both government and academic). Posters are tailored for individual sectors and reflect each sector’s approach to volcanic risk management. Therefore the ‘Advice for Airport Managers’ poster simply summarises likely impacts and directs airport managers towards national and global planning and response resources, such as the International Civil Aviation Organisation (ICAO) reference guides. The involvement of Air New Zealand Ltd (the major regional airline in New Zealand) and the New Zealand Civil Aviation Authority in designing and reviewing the poster was essential to create a resource aligned with industry standards and suitable for the New Zealand aviation sector. The restricted space in a poster format enforced concise summaries of impacts and mitigation measures. 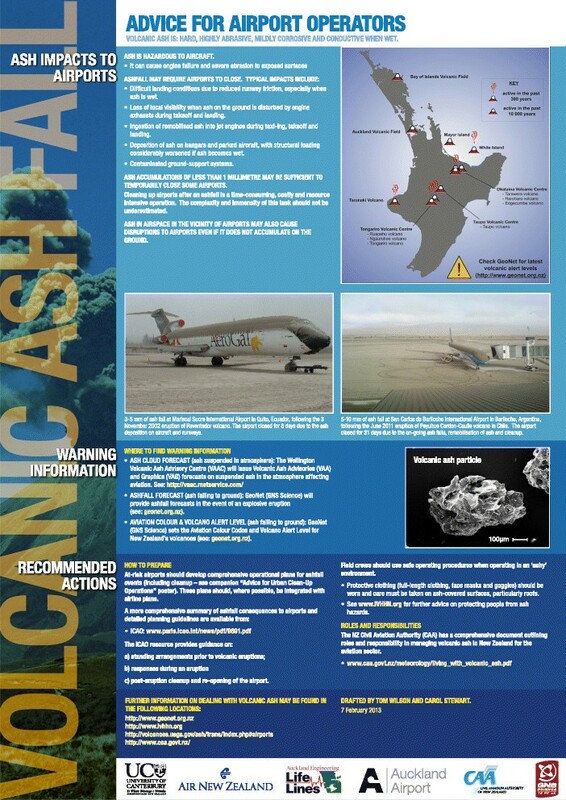 It was therefore important to be able to refer to further resources and the posters were designed to link with established, authoritative volcanic ash impact information sources. The USGS/GNS volcanic ash impacts website (http://volcanoes.usgs.gov/ash/) and the International Volcanic Health Hazard Network website (www.ivhhn.org) are referred to on nearly all posters, depending on topic and intended audience. Sector-specific resources are provided where available, such as the ICAO Manual on Volcanic Ash, Radioactive Material and Toxic Chemical Clouds (ICAO ) referenced on the poster on ‘Advice for Airport Managers’. The posters are designed as fact sheets which refer the specialist audience to specific information, such as further web-based resources or industry standards where appropriate. Language, terminology and graphics used on the posters are designed primarily for the target audience of New Zealand critical infrastructure managers. Design elements of the posters are described in Figure 17. Overview of the current (Series 2; Figures6,7,8,9,10,11,12,13,14,15) volcanic impact poster design elements. Compare with Series 1 to see changes (Figures 1, 2, 3, 4, 5). The posters underwent a two-stage review process. Initially they were reviewed by a team of eight scientists within the VISG project team, then submitted to a technical sub-group of the AELG or other appropriate organisations (Figure 16), typically including engineers, risk managers and business continuity advisors. Their feedback was used to revise the posters. This process was repeated as required, with up to five iterations in some cases. Posters were also reviewed by colleagues from the Alaska Volcano Observatory, who have extensive operational experience in responding to ash-producing eruptions and interacting with affected sectors before, during and after ashfall events. This provided a valuable external perspective. 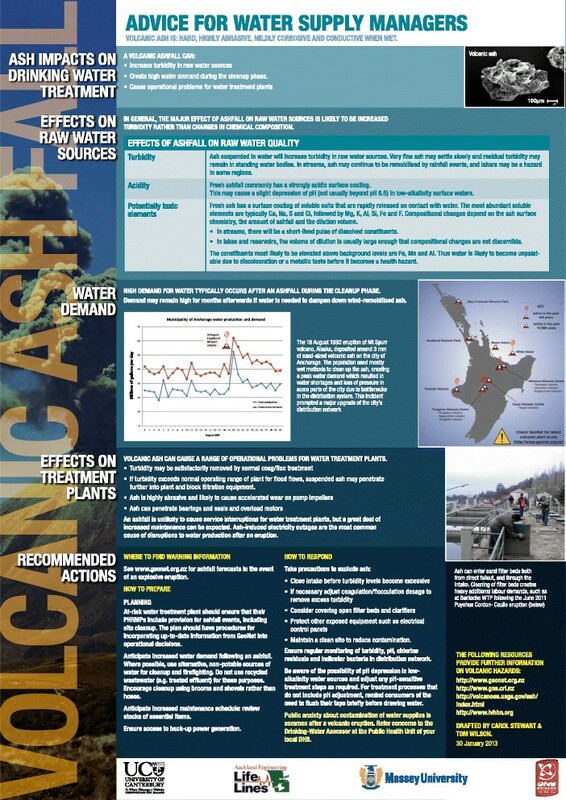 Once finalised, the updated Series 2 posters were distributed to all AELG members, to the New Zealand National Engineering Lifelines Committee for national distribution, and also hosted on the AELG and GNS Science websites as an open access resource (http://www.aelg.org.nz/volcanic-impacts/visg-projects/; http://www.gns.cri.nz/Home/Learning/Science-Topics/Volcanoes/Eruption-What-to-do/Ash-Impact-Posters). Public outreach talks and briefings by GNS Science staff in New Zealand, which regularly include briefings to regional engineering lifeline groups, routinely promote awareness of the posters, along with other preparedness and mitigation resources. An annual volcanic hazard short-course for infrastructure and emergency managers also uses the posters during exercises. They are also used in university teaching for scenario-based role-play simulations. Series 1 posters were also widely disseminated and utilised during the 2012 Te Maari eruption from Tongariro volcano. 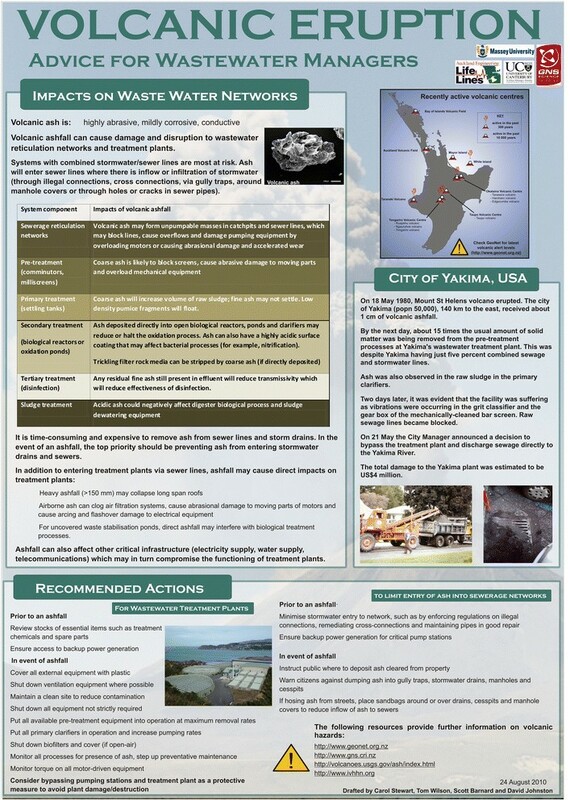 The suite of posters has also been shared internationally, via distribution by the IAVCEI Cities and Volcanoes Commission’s Volcanic Ash Impacts Working Group and will be hosted on the USGS Volcanic Ash Impacts Website (http://volcanoes.usgs.gov/ash/index.html) as a resource for the global community. A practical test of the posters’ utility occurred during the May 2008 eruption of Volcan Chaitén, Chile (Stewart et al. ). In early May 2008 widespread ashfall from the explosive rhyolitic eruption was distributed by the prevailing westerly winds over Argentina. The city of Esquel (pop. 35,000), located 110 km east of the volcano in Chubut province, Northern Patagonia, received approximately 5 mm of fine ash on the morning of 5 May (Figure 18A). Public authorities were immediately concerned about contamination of the city’s water supply as residents reported a ‘strong metallic taste’ in the drinking water. Chaiten ashfall in Esquel, Argentina. A) Approximately 5 mm of fine-grained rhyolitic ash fell in the town on 5 May 2008; B) The Canal de Faldeo open water supply line for Esquel, Argentina. The water sources for the city are primarily groundwater and thus are relatively resilient to ashfall contamination. However, there is a point of vulnerability where the water is delivered to the treatment plant along the open, concrete-lined 2.3 km-long Canal de Faldeo (Figure 18B). The water supply authority did not have any knowledge of potential impacts of an ashfall on the water supply. In their search for information they contacted a member of our research team (CS) who had authored a review of the subject (Stewart et al. ). She provided advice, in collaboration with a local university, on an appropriate water sampling and monitoring regime and interpretation of ashfall leachate data. Using the poster “Advice for water supply managers” (Figures 1, 2, 3, 4, 5), she also provided guidance on impacts and mitigation strategies. Water sampling showed that levels of sulphate and dissolved iron and aluminium were higher in the Canal de Faldeo than the raw water source, and to a lesser extent, in treated drinking water (Stewart et al. ). These elevated levels were sufficient to produce a noticeable taste in the final drinking water but remained well below Argentinian drinking water standards (see Stewart et al. ). The water authority was thus able to reassure the public that ashfall contamination of the water source did not pose a public health risk. Two-way exchange of information between the poster design team and the water authority was critical for ground-truthing and refining the management advice on the posters. Our predictions were that the primary impacts of the ashfall would be an increase in raw water turbidity and that water demand would increase as residents cleared ash from their properties. These both proved to be the case. Local authorities also noted the value of the poster’s advice to communicate information to the public in a timely and transparent manner as the metallic taste in the water had caused some anxiety about contamination of the water supply. The case study above illustrates that these posters may be useful tools during an eruption crisis beyond the New Zealand context for which they were designed. 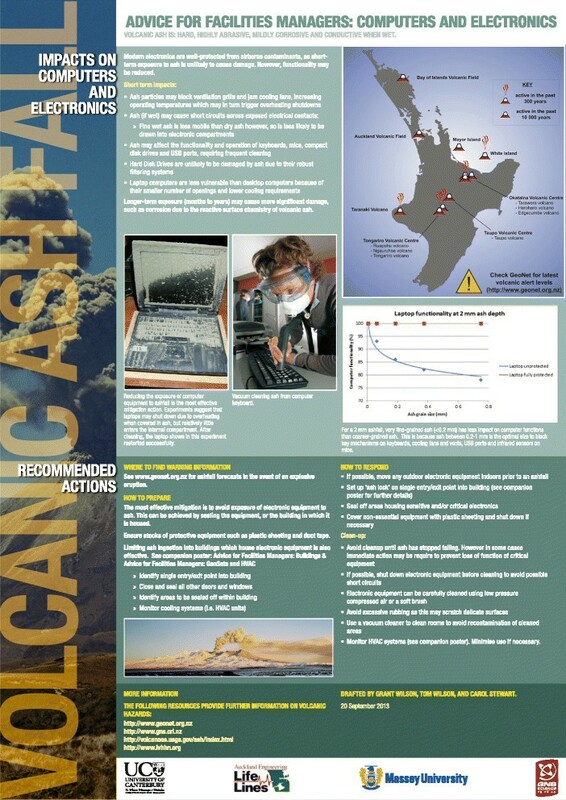 The technical and engineering content of the posters was based on findings of ashfall impact assessment trips, to an extensive range of volcanically-active countries (Table 1, Volcanic impacts research group). Thus, the advice given is applicable to infrastructure not just in New Zealand (which has highly-modernised infrastructure) but in other, less-developed, settings. For example, the ‘Advice for Wastewater Managers’ poster (Figure 7) describes ashfall impacts on individual system components, so that individual treatment facilities can select relevant components. Similarly, many components of infrastructure systems such as pumping equipment, HVAC units and engine components are universal thus the mitigation advice given is applicable. However, we note that the emergency management content of the posters is specific to New Zealand. 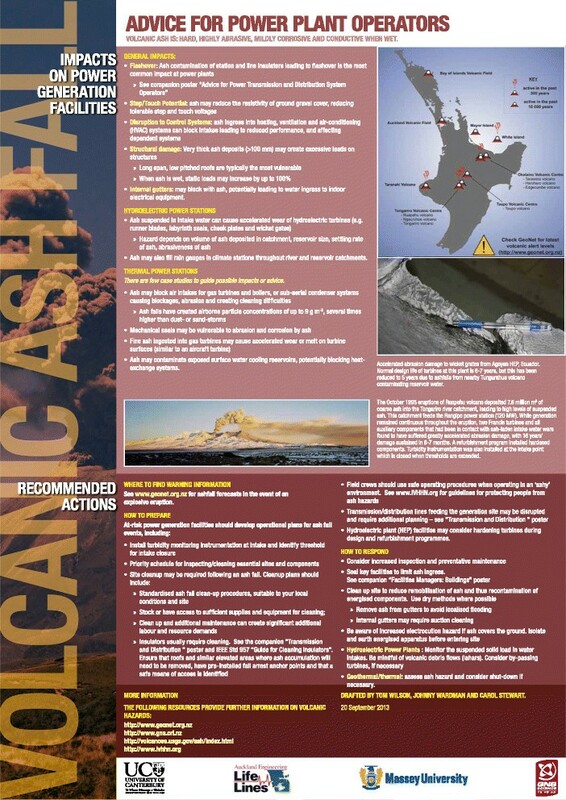 This includes aspects such as where to find warning information in the event of an eruption, and (for the ‘Advice for Airport Managers’ poster) contact details for the local Volcanic Ash Advisory Centre (VAAC). translation of volcanic impact research into practical management tools. 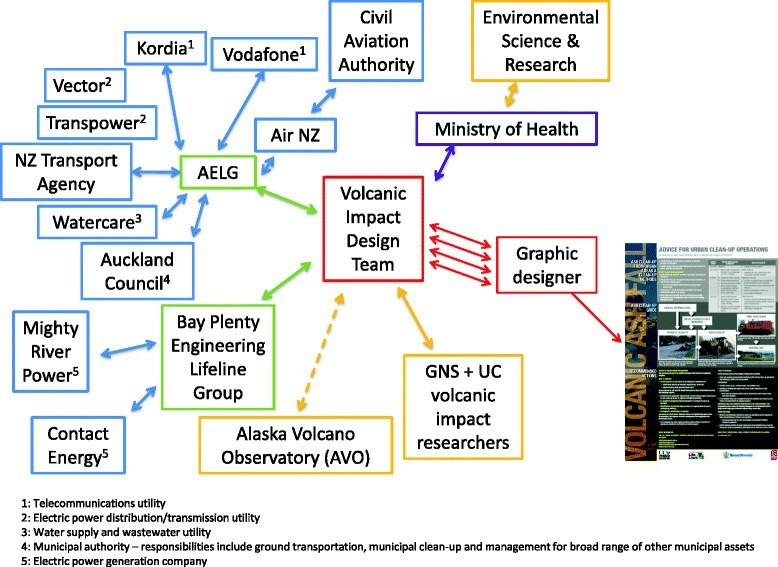 In addition to producing the posters, which are a unique global resource, the process has further enhanced and grown networks between volcanic impact scientists/agencies and critical infrastructure organisations. We note that our work has been developed in a New Zealand context and thus has relied heavily on the highly networked VISG and AELG structures, and existing risk management culture. 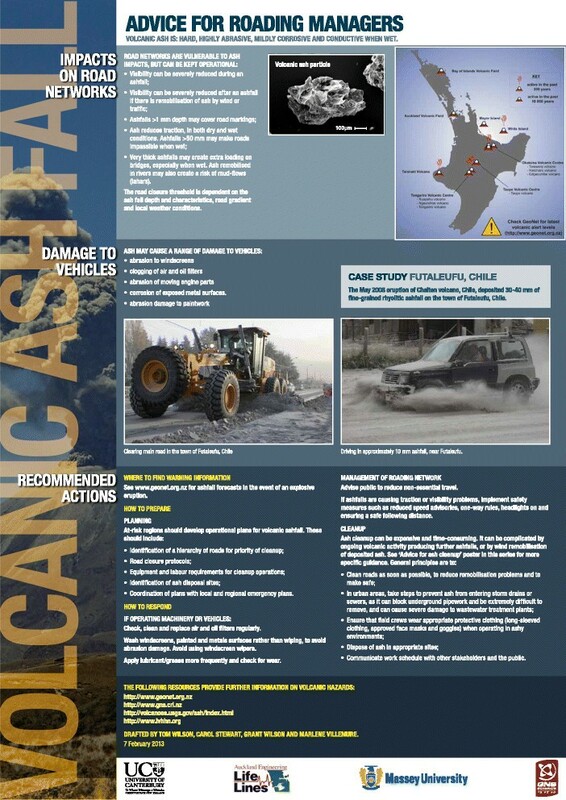 Whilst the posters have utility beyond New Zealand, as demonstrated by the Chaitén case study, we propose that this development process may be a useful model for strengthening volcanic risk resilience in other settings. We kindly thank all poster reviewers from the AELG, BoP ELG, NZ Ministry of Health and ESR. Special thanks to Brian Park (WaterCare), Scott Muspratt (Vector Ltd), Bob Fletcher (Air NZ) and Peter Lechner (NZ CAA). Our sincere thanks to Tina Neal and Kristi Wallace from the Alaska Volcano Observatory for their review of posters and continuing support. Thanks also to Jim Cole for supporting the project. We acknowledge funding support from AELG, the DEVORA project (funded by the Earthquake Commission, Auckland Council and Ministry of Business, Innovation and Employment), and MBIE Research Contract C05X0907 (TW, CS, DJ). TW and CS planned and conducted the research, and wrote the manuscript. JW, GW, DJ, DH, SH, MV and LR contributed to poster content and design. SM, GL, MD, ND sand LR contributed to poster design and review and to manuscript preparation. All authors have read, reviewed and approved the final manuscript.